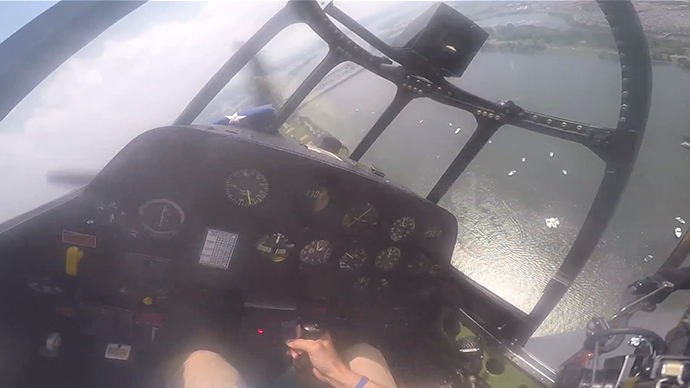 The pilot of a vintage Avenger torpedo bomber who made an emergency landing during a VE Day flyover in Washington DC has released cockpit footage of the incident. The incident took place during the Arsenal of Democracy flyover above Washington DC commemorating the 70th anniversary of World War II victory in Europe. The video, lasting almost 7 minutes, details what happened and is supplied with ample commentary by the pilot. The pilot initially thought his World War II-era aircraft was on fire, seeing a smoke-like substance fill the cockpit (starting at about 1:32 in the video). It was in fact vapor from a punctured hydraulic system tube. "When hydraulic fluid is forced from a pinhope at [a pressure of] 1500psi it vaporizes," the pilot comments in the video. "Hydraulic vapor and smoke are identical in appearance and motion, differentiated only by smell." "At the first sight of the vapor, I was in disbelief," he admitted. "There is no chance that something could be wrong at this exact moment. The odds of an emergency at this moment with all the flying done in the previous days and hours are infinitesimally small." He then heard the passenger he had on his back seat shout, "Are we on fire?" (at 1:48 in the video). The pilot frantically looked around. With his cockpit filled with what he thought was smoke, he decided to reroute to the Reagan International Airport for an emergency landing. Looking around, he saw his passenger and, adding to the fear of the moment, thought the man had passed out (his slumped head seen in the right side of the screen at 2:29 in the video). It later became obvious he had taken off his headset and was looking down to find the source of the presumed fire. The plane landed safely and the crew escaped in an emergency... only to discover there had been no fire to begin with. Moreover, had they known the symptoms of an in-cockpit hydraulic tube puncture beforehand, they would have been able to complete the flyover, as the Avenger has a backup system for manual control of the wingflaps and landing gear - which is exactly what the hydraulic system is responsible for. The Avenger flew as part of a Missing Man formation towards the end of the flyover. The Avengers' wing was organized by the Texas Flying Legends museum, and, according to the pilot, the team had 16 hours of training during the week preceding the flyover alone. The pilot, who does not give his name in the video, says he has experience with over 100 aircraft, and has been flying an Avenger for three years. His emergency landing added to the flight delays at the airport, which was already closed for arrival and departure for the duration of the Arsenal of Democracy flyover.